Hair style is important and the posts that I have show pictures of nice hairstyles, but I dont go into detail about what hair looks good on different face shapes. Take a good look in the mirror. 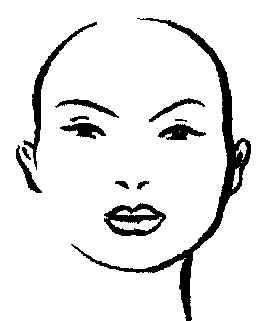 Pull your hair back in a pony tail and see what face shape you have. Only slightly narrower at the jaw line than at the temples, with a gently rounded hairline. A variety of styles . . . most any hair shape looks good on you. Your “perfect” features allow you to wear more styles than any other face shape. Have you ever noticed the majority of models fall into this shape? Have you noticed how many different hair styles they can wear? You can wear short, medium and long hair styles. 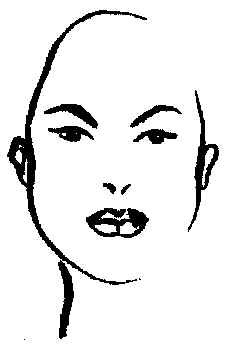 Your face shape is well “balanced” or in even proportion. You will look best when styling your hair off your face. Most oval face shapes can wear slicked-backed looks as well. Covering up your “perfect” features with heavy bangs, or too forward-directed styles. 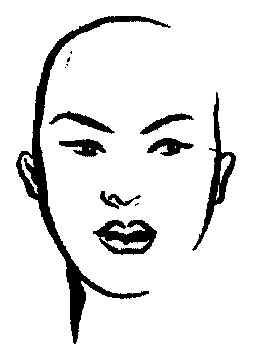 In wearing your hair style on your face, you’ll lose your face shape behind the hair. It may appear to add weight to your face. Long and slender, about the same width at forehead and just below cheekbones. May have a very narrow chin or a very high forehead. Short to medium lengths. Fullness at the sides of your face. Soft wispy bangs. You’ll want to balance the look of a long and slender face. Soft wispy bangs will shorten the appearance of the length. Fullness at the sides of your face will add width to the look of your face shape. To much hair length . . . your face will look even longer! Too much height lengthens your face. Center parts. When your hair gets past your shoulders there is a good chance it is doing you more harm than good. The models with rectangular face shapes and long hair, get by with it only because they have a “on call” hairdresser who is busy primping and teasing, setting and styling to add fullness to the hair. Since most of us don’t have this luxury, my suggestion is keep it above shoulder length. Full-looking face with a round chin and hairline. Widest point is at the cheeks and ears. hair styles with fullness and height at the crown. Off center parts. Short hair styles with a swept-back direction or hair styles that are longer than chin length. By layering the top to achieve fullness and keeping the rest of the cut relatively close to the face, your face shape will appear longer and narrower. 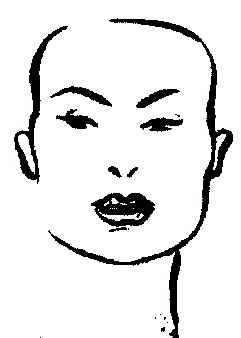 Chin length hair with a rounded line that mirrors face’s circular shape. Center parts. Short-short crops, straight “chopped” bangs. Fullness at side of ears. A rounded haircut ending at the chin will certainly add weight to your face shape. Because the widest part of your face is at the cheeks and ears, you need to avoid having the fullness of the cut here as it will make your face appear wider. A strong, square jaw line and usually an equally square hairline. Short-to-medium length hair, especially with wave or roundness around the face. Wispy bangs. Off-center parts, height at the crown. You want to soften the square look of your face with layers and wispy looks around the face. Height at the crown will elongate your symmetrical shape. If your hair is straight you may want to consider a body wave, as some curl or wave to the hair will achieve a nice balance to the straight features of your face shape. Long straight styles that accentuate square jawbone. “Linear” straight bangs or center parts. A straight bob ending at the jaw line is the wrong thing to do for your face shape. You can wear a layered bob, however it should end above or below the jaw line. Make sure in styling that you achieve some roundness to the shape and some height at the crown or bangs, and you will be on the right track. Chin-length or longer styles. Side-parted hair styles. Swept-forward layers around the upper face, gently wispy bangs. A chin length bob is great on your face shape! This creates a balanced look by giving fullness where you need it. You can wear shorter styles, however, if you are a dramatic heart shape you need to leave weight in the back nape area. This will achieve more balance between your dramatic cheekbones and more narrowing chin. Short, full styles that emphasize upper face. Height at the crown. Severe, slicked back looks. If you are a dramatic heart shape, the short full styles with tapered necklines which emphasize the upper face will make you look top heavy. Too much height at the crown will give the appearance of a longer and narrower chin. Just remember if you have a dramatic heart shape face, you have great cheekbones to emphasize! Don’t miss the boat by getting a cut which is to top heavy. Reverse of the heart-shape . . . a dominant jaw line with narrowing at the cheek bone and temples. Shorter hair that balances prominent jaw line. 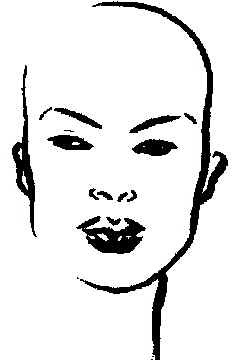 Styles that are full at the temples, taper at the jaw. Off center parts. Wedges and shags look great on you. You need lots of layers to achieve fullness through the upper part of your face. By wearing styles which are full at the temples and taper at the jaw line, you achieve a balance which can be remarkable, in accenting features otherwise understated. Try tucking hair behind your ears as this will draw attention to your eyes and add width in this area. Long, full hair styles that draw attention to jaw line. Center parts—off-center is more flattering. Too much height at the crown. You want to stay away from putting most of the weight of a haircut at the jaw line and below. This will give the appearance of added weight to the face. A cross between heart and a dramatic oval. Widest at the cheekbones, and narrow equally at the forehead and jaw line. Your face shape is balanced and dramatic. Try a variety of styles. Almost everything works with your face (as long as you are a true diamond). You can wear shorter styles, however if you are a dramatic diamond shape you need to leave weight in the back nape area like a heart shaped face. This will achieve more balance between your dramatic cheekbones and more delicate chin line. You can do just about everything, but try not too wear to much hair on your face, thereby hiding your great features.